Special Record for The Coca-Cola Export Corporation. The single could only be bought at grocery stores. 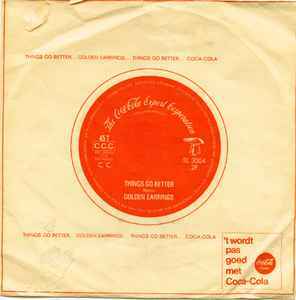 The single was 'packed' in a 4 page leaflet (a bit wider and a bit shorter than A4 format) for Coca Cola. On page 3 the singlecover was glued, which is the reason that all (?) covers have spots of glue-residue. According to several fansites (such as AlbinoMoon.de and Golden-Earring-Museum.nl) the single was (also) issued in combination with the Dutch musicmagazine "Teenbeat" (edition October 1966).